A contemporary history of a critical period, Are We Ready? analyzes the impact of 9/11, the anthrax attacks that followed, and preparations for a possible smallpox attack on the nation's public health infrastructure. David Rosner and Gerald Markowitz interviewed local, state, and federal officials to determine the immediate reactions of key participants in these events. The authors explore the extent to which these emergencies permanently altered the political, cultural, and organizational life of the country and consider whether the nation is now better prepared to withstand another potentially devastating attack. 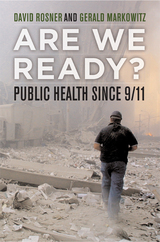 This well-reasoned and well-researched book presents compelling evidence that few with hands-on experience with disease and emergency preparedness believe that an adequate response to terrorism—whether biological, chemical, or radiological—is possible without a strong and vibrant infrastructure to provide everyday services as well as emergency responses. Are We Ready? begins with an examination of the experiences of local New York officials who were the first responders to 9/11 and follows them as events unfolded and as state and national authorities arrived. It goes on to analyze how various states dealt with changing federal funding for a variety of public health services. Using oral histories of CDC and other federal officials, the book then focuses on the federal reaction to 9/11 and anthrax. What emerges is a picture of dedicated public servants who were overcome by the emotions of the moment yet who were able to react in ways that significantly reduced the public anxiety and public health threat. Despite the extraordinary opportunity to revitalize and reinvigorate the nation’s public health infrastructure, the growing federal and state budget deficits, the refocusing of national attention on the war in Iraq, and the passage of time all combined to undermine many of the needed reforms to the nation’s public health defenses. David Rosner is Professor of Public Health and History at Columbia University and Codirector of the Center for the History and Ethics of Public Health at Columbia's Mailman School of Public Health. Gerald Markowitz is Distinguished Professor of History at John Jay College and the Graduate Center of the City University of New York. They are coauthors of Deceit and Denial: The Deadly Politics of Industrial Pollution (UC Press). "This book provides insight into the events of 9/11 and the anthrax attack through the experiences of numerous players at the federal, state and local levels. In so doing, it offers a better understanding of the events, the complexities, the challenges and the responses than have previously been conveyed in press accounts. The result is a picture of public health under stress and in action. The reader will have a better appreciation of what "readiness" and "being prepared" mean in the context of a public health emergency. "—Jeffrey Koplan, MD, MPH, Vice President, Academic Health Affairs, Emory University. Conclusion: What Lessons Have We Learned?